Yet achieving these benefits requires driving traffic to your website the right way, and a focus on driving quality traffic. In this post, we’ll cover free ways to drive traffic to your website in a way that impacts your bottom line. Traffic to your website helps to improve your rank which in turn generates more traffic, but you want to make sure that the increase in traffic is associated with an increase in engagement as well. If your traffic is increasing but your conversion rates are decreasing, you’re not bringing in the right traffic. There are a number of ways to optimize your website for conversion—such as by including calls to action and lead capture forms in the right places, providing the information your visitors are seeking, and making navigation easy and intuitive. But the first step is to be attracting the right visitors to your site in the first place. Your goal when it comes to website traffic is to be driving more qualified visitors to your site. That is, those who are most likely to convert into leads and customers. There isn’t one set it and forget it tool that generates free and high-quality website traffic to your website. Rather, there exists a mix of channels that work together to drive visitors. Some require effort, some require time, and some require money. In the next section we’’ll go into more detail on the most effective (and reliable) ways of increasing website traffic for free. 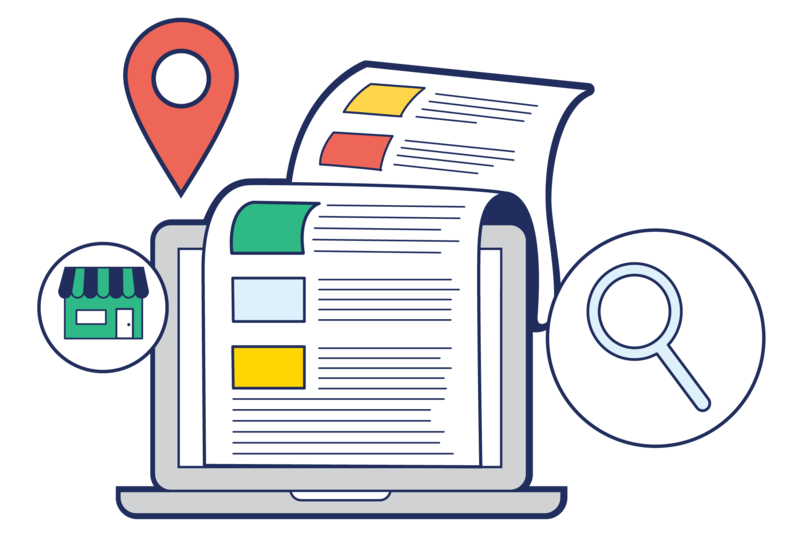 Did you know that an optimized Google My Business listing gets 7x more visits than an incomplete one? Don’t forget that your listing links to your website, so this is a great way to get more traffic to your website. Keep in mind also that Google is getting smarter and smarter with results. If your listing provides all of the information a potential customer needs to make a decision, they might forego your website and contact/visit your business directly—even better than a website visit! There are many SEO tactics you can perform on each of your website pages to increase their rank in search engines and get more visitors. This includes producing high-quality content that your audience is searching for, and writing concise meta descriptions for your pages. The meta description appears below your URL in search results. Knowing what a page is about and what will result in a click makes users much more likely to do so. On-page SEO tactics such as these are free, but do take some time. For more help with on-page SEO, check out this blog post: Google Ranking Factors: On-Page vs Off-Page SEO. Here are ten additional steps you can take to increase your website traffic. Another way to increase traffic to your website is to get listed in free online directories and review sites. For most of these sites, your profile will have a link to your website, so actively updating these listings and getting positive reviews is likely to result in more website traffic. In addition, many directories like Yelp have strong domain authority on Google. There’s a chance that your business’s free Yelp page could rank high for relevant searches. A backlink is a link to your website from another website. Backlinks from complementary businesses or industry influencers will not only get your business in front of a larger audience, but it will also drive qualified traffic to your website. In addition, Google picks up on backlinks and will increase its trust in your business if it sees other trusted sites pointing to yours. More trust from Google leads to higher rankings, which leads to more traffic. Social media is one of the most popular free marketing tools around, and plays a role in driving traffic to your website. Use Facebook, Instagram, and LinkedIn to promote blog posts and other useful pages on your website. This way you can turn your social media audience into website visitors, and draw traffic from their networks if you post shareable content. Creating useful content is free, and is not as hard as it may seem. You are the expert in your product/service; your job is to simplify it for your audience. By adding hashtags to posts that promote your website pages and blog posts, you can extend your reach beyond your network and get discovered by users searching for your products and services. The more eyes on your links, the more free traffic you’re getting to your website. Landing pages are another free source of traffic to your website. These are pages specific to your offers, such as for redeeming a discount code, downloading a free guide, or starting a free trial. They contain the details users need in order to move forward and convert, and focus on one specific call to action, making it more likely to happen. Because landing pages are so specific, you can get very targeted in your messaging, increasing the traffic coming to those pages. While short-tail keywords are often searched more frequently, it is more difficult to rank for them on search engines. Targeting long-tail keywords, on the other hand, gives you a better chance of ranking higher (even on the first page) for queries specific to your products and services—and higher ranking means more traffic. Plus, as search engines and voice-to-text capabilities advance, people are using more specific phrases to search online. There are many free tools available to help you find keywords to target, such as Answer the Public. Sending out regular newsletters and promoting offers through email is a great way to stay in touch with your customers and can also help to get traffic to your website. Provide useful information and links to pages on your website where they can learn more, such as through blog posts and landing pages for particular offers. Just make sure that you don`t continually bombard your readers with emails or your customers will either disengage with, delete, or unsubscribe from your emails. Having an industry influencer publish a blog post on your site or turning an interview with them into a blog post can help to drive traffic both through organic search but also via that influencer promoting the content to their audience (see the backlinks section above). This can also help to add more variety to your content and show your visitors that you are active in your field. Alternatively, you could ask the influencer to mention your business in their own review or round-up post. This method is still free, but you still need the collaboration with the influencer to be an exchange with mutual benefit. It’s free to be active in online groups and on websites that are relevant to your business and community—and it helps you to obtain more traffic. Comment on blogs and social media posts, answer questions people are posting, and participate in conversations about your industry. The more you engage with your community, the more exposure and profile visits you get. If your social media profiles contain a link to your website, then you’ve turned your engagement into another channel for website traffic. Just be sure to engage moderately and in a sincere way, and avoid including links to your website in your comments—lest you appear spammy and hurt your online and business reputation. Increased traffic should not be the goal of your engagement, but rather a secondary result. Google Analytics is free to use, and the insights gleaned from it can help you to drive further traffic to your website. Use tracked links for your marketing campaigns and regularly check your website analytics. This will enable you to identify which strategies and types of content work, which ones need improvement, and which ones you should not waste your time on. Paid advertising on Google is a great way to drive people to your website who are seeking out the services you provide. With Google Ads, you pay to have your website (usually a landing page) show up at the top of search results for particular keywords. When a query is entered using those keywords, Google looks at all accounts bidding on those keywords and will display and rank the paid results according to the quality and relevance of the advertisement. Paid search results show up first, at the very top of results pages. This type of exposure is a great way to generate more traffic to your website by qualified visitors. Furthermore, you only pay when someone clicks on your ad. You can also select preferences through the Google Ads platform so that your business shows up at the top of Google Maps search results. As with regular paid search ads, there will be an indicator next to your listing that this is a paid result, but the exposure you get from appearing at the top is invaluable. Social media, display, and retargeting ads are all excellent channels of PPC advertising to boost website traffic. While with search advertising, you’re paying to show up in the top spot for relevant searches, with social media advertising you are paying to show up in relevant feeds. With both forms of advertising, you can specify the type of audience in front of which you’d like to appear, but with more psychographic data, social media offers superb targeting. Display ads are branded banner ads that get placed on relevant websites. If you are a fitness business and your ad appears on a webpage about athletic gear, your ad is likely to drive relevant traffic to your site. Retargeting ads can appear on websites or social media feeds. They are placed in front of people who have already visited your site once, and who are therefore more likely to return. Google can detect spammy behavior, gets suspicious of spikes in activity, and monitors how users are interacting with your website. Using an automatic traffic bot or generator is likely to attract the wrong kind of attention from Google which will hurt your reputation with them and thus your ranking. The ultimate purpose of getting more visitors to your website and ranking higher on Google is to increase the number of people who interact with (and hopefully become customers of) your business. If your visitors aren’t targeted, they aren’t likely to engage with your website, and you’re more likely to see your lead and conversion rates decline. If your website is attracting bot traffic, you run the risk of getting blocked from online advertising platforms or, even worse, getting removed from Google. Cheap website traffic is not worth it! Take the time to build up high-quality and sustainable traffic to your site. Getting free website traffic may not cost you monetarily, but it will require effort on your part. However, the effort you put in will equate to the quality of the traffic you generate. As mentioned above, there is no point in getting more traffic to your website if those visitors are not likely to engage with your pages, convert into leads, or become customers. • Enables your business to get found in mobile searches, which have surpassed desktop. • Uses visuals to provide consumers with a sense of what it’s like to actually be at your business, knocking down uncertainty which is a major barrier to entry. • Equips searchers with the ability to interact with your business directly in your listing—increasing the chances of engagement and obtaining new customers. Getting more website visitors does not happen overnight. It takes some effort but we’ve eliminated the hard part for you: knowing what to do in the first place. By using Google My Business and the other safe channels listed above, you can get the right visitors coming to your site and more importantly, more of those visitors converting into customers.